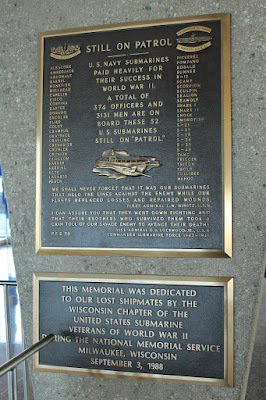 The marker is located on the north bank of the Milwaukee River, on The Manitowoc County 28 Boat Memorial Walk, on the bridge of the U.S.S. Cobia (a National Historic Landmark), at the Wisconsin Maritime Museum, at 75 Maritime Drive, Manitowoc, Wisconsin 54220. On Eternal Patrol: Ralph Clark Huston, Jr.
0534 Huston Ralph Clark Jr. 755-96-96-S1c, USNR died of wounds received in gun action. The marker is aboard the U.S.S. Cobia. The memorial is visible to the right. This photo of Submariner Ralph Huston is in the U.S.S. Cobia mess hall.